NORTH OGDEN, Utah — The mayor of a Utah city was killed during an attack in Afghanistan while he was serving with the state’s National Guard, authorities said. North Ogden Mayor Brent Taylor died Saturday in an apparent “insider attack” in Kabul, the capital of Afghanistan, the Salt Lake Tribune reported. Another U.S. service member whose name was not immediately released was being treated for wounds sustained in the attack, U.S. military officials said. Herbert scheduled a Sunday news conference with Maj. Gen. Jefferson Burton, the adjutant general of the state’s National Guard. 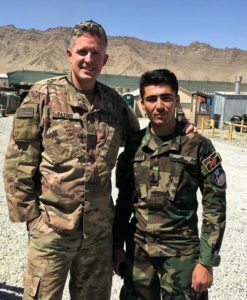 Left: In one of his last pictures posted to Facebook before an announcement on Saturday that he died in an attack, Mayor of Ogden in Utah Brent Taylor wrote in the caption, "My friend Lieutenant Kefayatullah, who was killed fighting the Taliban the day before voting began. Brave Afghans are fighting hard for their country." At least 50 Afghans died in election day violence. Will future votes be safer?